‘Tis the season to get crafty! Not only are homemade holiday decorations and Christmas keepsakes unique and adorable - they’re tons of fun for the family. Gather your friends and family around the table and, with a few affordable supplies, you can create Christmas memories and keepsakes that you’ll have for years to come. There’s no need to spend tons of time or money to show off your holiday spirit. Take a look at these simple but fabulous Christmas DIY Ideas to celebrate the holiday cheer during this festive time of year. 1. Tassel Garlands - These are an elegant yet whimsical finishing touch to your holiday home decor and, even better, you can customize the colors and length to fit your color scheme and personal style. Take a look at this fun, easy tutorial here! 2. Christmas Tree Card - Ditch the mass produced Christmas cards this year in favor of these adorable handmade Christmas tree cards with fun pom pom “ornaments”. Find everything you need to make these sweet holiday cards here! 3. Tabletop Pom Pom Christmas Tree - This chic decoration looks like it came just from a magazine, but can be made in a matter of minutes! All you need is a cone in whatever size you desire, felt balls, and glue! Simply affix the felt balls in your desired color combinations to the cone with glue and voila! Tres chic Christmas decor! 4. Tassel Ornaments - The Christmas tree ornaments of your dreams are only a snip snip away. For these sassy tassel ornaments all you need is yarn, 1cm felt balls, wooden beads, string, and basic sewing essentials such as scissors and needle. Choose your favorite holiday colors to create a chic magazine worthy look. 5. Cake Toppers - Transform a simple cake into an adorable holiday display with a felt ball cake topper. All you need is 1cm felt balls, string, needle, bamboo skewers, and a few spare moments. You’ll look like a holiday decorating hero! 6. 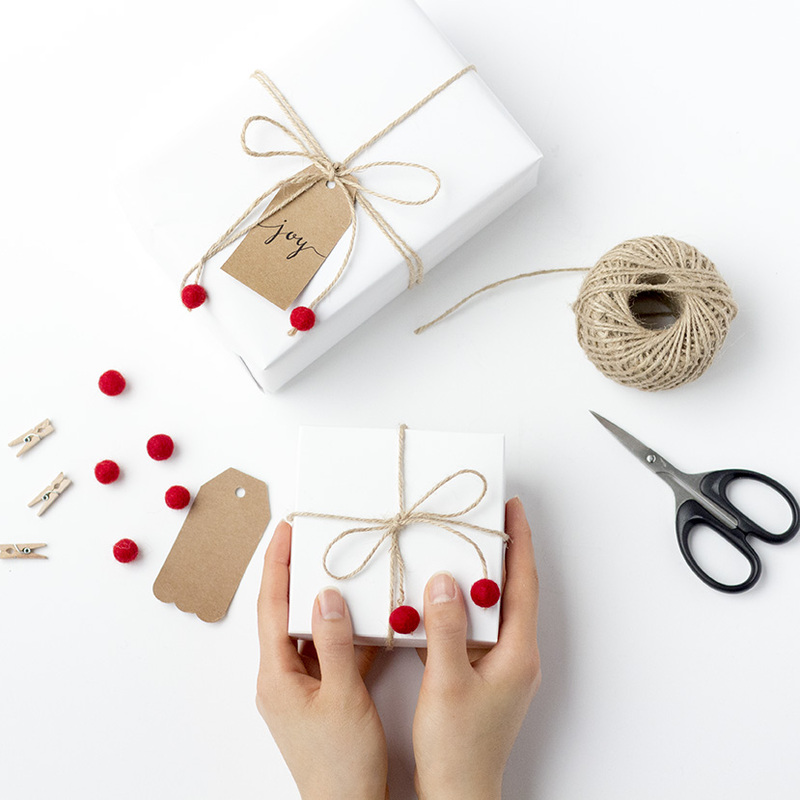 Gift Wrapping - It’s the little things that count during the holiday season. So many people half-heartedly choose wrapping paper or skip gift wrapping all together. Give the perfect gift, the perfect display it deserves with darling little felt ball accents. All you need is a little twine, 1cm felt balls, and a few spare seconds. 7. Baubles - Simple is often dismissed as boring, but really, it’s elegant - timeless. These simple bauble ornaments are the easiest (and cutest) ornaments you’ll ever make. Simply fill clear baubles with 1cm felt balls in the color combination of your choosing and you’re done. Elegant winter wonderland tree in mere minutes! Now that you’ve been armed with these fab ideas, go forth and spread the holiday cheer with unique, thoughtful, and gorgeous Christmas decor and keepsakes!